This is the second article written by us on T Ball Drills. What you will find in this article is information that will help you be better prepared for your first game. The first article, Tee Ball Drills - Part I- Practice Tips gives you helpful tips on how to run your t ball practices. If you haven’t read it and even you have already started practices, we feel it would be helpful and suggest you read it next. It has some great t ball drills for you to use. Unless you know all the kids on your team, you are going to run into some situations that will surprise you and where there is just nothing you can do. Here is an example. Our t ball team practiced once every week and played on Saturdays. The league let everyone know ahead of time that was the schedule. I had a boy on that team whose mom brought him to every practice. The practice before the first game, she told me that “Johnny” was not going to make it to the game on Saturday. In fact, she told me he would only make about every third game. She was divorced and the boy spent many weekends with the dad. The dad lived some distance away, and was not going to bring him to games. There was nothing I could do but say I looked forward to the games he could make. He had been doing great with the t ball drills and I’m sure he was disappointed. Also, when you are handed a team drawn out of a hat, you are going to have some helpful parents and some not so helpful parents. In fact, you may get parents who seldom bring their child to practice, or are always late for a game. The one thing to always remember in these situations is it is not the child’s fault. Do not limit his playing time because of his parents. It may not seem fair to some of the other parents and players, but the child does not deserve any different treatment than all the other players. Tell your parents to be at the game fifteen minutes early. 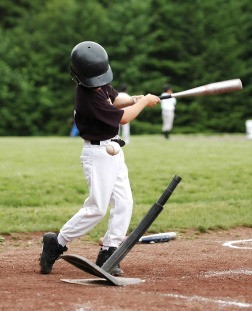 In t ball, there is no pre-game warm ups drills. You might have a little time to try and play some catch, but no time for t ball drills. Even though there is no warm ups, you want to tell your parents to be there early, hoping that they at least won’t be late. And there will still be some players arriving late. Always happens. Again, don’t punish the child because his parents ran late. Maybe ask the parents if they lost their schedule, because they arrived after the starting time of the game. They will get the hint. Here are some tips to help the game run smoothly. 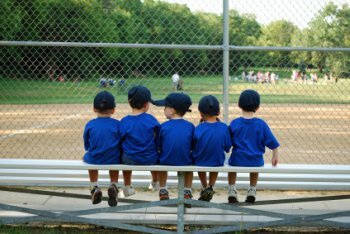 When your team is up to bat, always have your whole team sit on the bench in batting order. You will need a mom or dad to be the bench coach and to keep them on the bench and in batting order. Kids are kids and if they are left unattended, they will jump up and start running around. 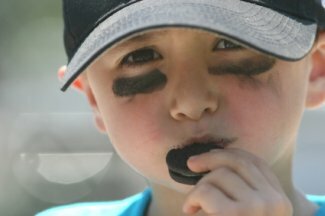 And if you have to have a search party every time a new batter is due, it will be a long game.Another absolute must during a t ball game is do not allow any child to have a bat in his hands until he is at home plate. That’s right, no on deck circle needed in t ball. This is a safety caution and probably should be the biggest rule you enforce. No bending whatsoever on this rule. And our last helpful tip for t ball games, always have someone bring snacks for the players after the game. At this age kids will never ask you the score of the game. Instead they want to know who brought the snacks. And in this day and age there a few questions you will need to find out from parents early on at practices. Do any of the children have food allergies? You will be a hero to parents of kids with food allergies if you do get this information to everyone. And my last piece of advice for t ball coaches, relax. I was pretty uptight my first year of coaching and really, there was no reason to be. Parents just want their child to experience some t ball drills and games and to have some fun. You will do just fine.